The website is owned and managed by Daniel Beauty Ltd. Our postal address is 9 The Gateway, Woking, Surrey GU21 5SN and we make every effort to ensure that your privacy is protected. If we ask you to provide certain information with which you can be identified when using this website, you can be sure that it will only be used in accordance with this privacy statement. Daniel Beauty Ltd may change this policy from time to time by updating this page. You must check this page from time to time to ensure that you are satisfied with any changes. This policy is effective from May 14th 2018. Daniel Beauty Ltd operates servers in the United Kingdom and the Netherlands where all personal information you provide us can be stored. We will only ever use your email address and personal details to process your booking. With your permission we will also use your contact details to contact you by email, text or phone. On your first visit you will be asked to sign a form to agree to this. If you do not wish to be contacted we will not add you to our client databases. If you no longer wish to receive our emails, you can unsubscribe from the link on the email, email us or call us. If you no longer wish to receive our text messages, you can text the unsubscribe number on the text, email us or call us. When you make a booking, we need to know your name, address, phone number and email address. You will also be asked to complete a short questionnaire about your health on your first visit. You have the option to withhold personal information that is you do not wish to pass to us. Your health records are kept in paper format only in a lockable cupboard. We only use data within Legitimate Interests. We use your personal information solely for payment, billing and to maintain our client databases. We do not sell, rent or exchange your personal information with any third party for commercial reasons, beyond the essential requirement for credit/debit card validation during purchase or to comply with any legal obligaitons. To improve our service to you we also store your phone number on our company phone. Our electronic customer databases are maintained by Constant Contact and Text Marketer. These only contain your name email address and phone number. Your health records are maintained in paper format only. We follow strict security procedures in the storage and disclosure of information which you have given us, to prevent unauthorized access in accordance with the UK data protection legislation. We do not collect sensitive information about you except when you specifically knowingly provide it. In order to maintain the accuracy of our database, you can check, update or remove your personal details by emailing or calling us. duration of a user session. The purpose of this general visitor data is to optimize the layout of the website. 6. You can share your experience via social media such as Facebook and Google. Our website uses a technology called Google Analytics and server logs to gather information about how the website is used. When you visit a website, the computer of that site asks your computer for permission to store this file on a part of your hard drive that is specifically intended for cookies. The collected data includes the day and time of your visit, the IP address or the location of your computer and websites that you have visited just before or after your visit to our website. The technology we use is Google Analytics. Cookies do not allow us to collect personal information about you and we generally do not store personal information that you have provided to us in your cookies. We use this information to measure the popularity of our website and to make improvements. You have the right to inspect, correct and / or delete the personal data retained by us. Email daniel@danielbeauty.co.uk and we'll provide details of the information we hold about you and remove or correct anything on request. We use CCTV on the premises for security reasons. The images are not transferred to the internet, just kept on a hard drive on the premises. our latest treatments and therapies. From bushy brows to hairy toes and everything in-between, waxing is one of the most popular beauty services. I offer full body waxing at my home between Woking and West Byfleet in Surrey. Your privacy and confidentiality is assured at all times. Daniel offers a variety of different massage therapies to suit your requirements. 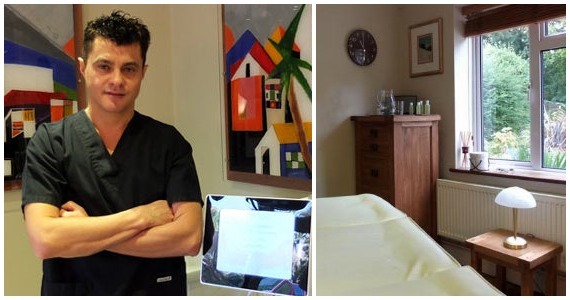 Whether you're looking for relaxation, relief from aches and pains or a just an improved feeling of well-being and balance, Daniel offers a natural massage therapy tailored to you. Why not treat yourself to a refresghing facial? A facial cleans, exfoliates and nourishes to promote clear, well-hydrated skin. A facial treatment includes steam, exfoliation, extraction, creams, lotions, facial masks, peels, and massage.